A love story between the sweet Lake Mälaren and the Baltic Sea, more than 20,000 islands and reefs, plus a military stronghold and 54 bridges, made way for this year’s version of the Eurovision Song Contest. The first time the name Stockholm shows up in writing is in the year 1252 when Birger Jarl had a fortress built on the island Stadsholmen, known today as Gamla Stan (the old city). The reason why was to protect the vital city of Sigtuna , and also provide a military stronghold for both the army and navy. The brilliant location, and the increase of trade in the entire Baltic Sea area, meant that Stockholm experienced a boom in population, and in a few decades it was the largest city in Sweden, but it was not yet the capital, and the king did not even live there, because at that time it was tradition that he moved around in his kingdom. During the Kalmar Union, 1397 to 1523, Sweden was ruled from Denmark, and Stockholm became soon the rebels’ nest under the nobleman Gustav Vasa. The Danish King Christian the Second overcame the rebellion when, in 1520, he seized control over Stockholm, killing most of the Swedish noblemen, but one got away, Gustav Vasa. He was able to raise support for his ongoing fight for a free Sweden and in the year 1523 the Kalmar Union was dissolved, and Gustav Vasa appointed King of Sweden. Many times over the next two centuries Denmark and Sweden went to war over the southern regions of Sweden, ending up with Denmark losing land, but delivering a blow to the Swedish navy, destroying it almost completely in 1677. In those days Stockholm, and Sweden, was a major player on the European scene, ruled by King Gustav the Second Adolf (1611-1632) who also made Stockholm the capital. But the many wars in northern Germany and Poland took the best part out of the population and ruined the economy of Sweden, making way for a period of decline. When the Industrial Revolution hit Europe in the 19th Century, Stockholm once again bloomed with an increase of population so fast that many were living under very poor conditions. That was to change in the years after the Second World War, when a great step was taken with the building of the Stockholm subway, a lot of rundown buildings were torn down making way for a new modern capital. 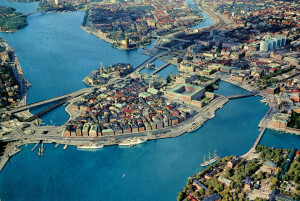 The city lies on mainland Sweden and 14 islands, and is held together by 54 bridges. Coming to Stockholm by sea is said to be one of the loveliest views in the world because of the more than 20,000 islands and reefs that surround it. And Stockholm is often named the Venice of the North. Two dramatic incidents have placed Stockholm on the international crime scene. A bank robbery in 1973 that went wrong, and the ensuing bank siege by the police, that lasted from August 23 ending five days later, and where the hostages developed sympathy for the robbers, gave the world the diagnosis “The Stockholm Syndrome”. And the second incident was when the Swedish Prime Minister, Mr. Oluf Palme, was shot dead on the 28th of February 1986. A killing not yet solved, and which is still, now 30 years later, haunting the country. Ending it all a bit more positively , let’s take a look at international sport events in Stockholm. In the summer of 1912 Stockholm hosted the 5th Olympic summer games, it was held in the newly build Olympic stadium. And in 1956 it was once again an Olympic arena , this time for the equestrian events. The games where held in Melbourne Australia, but due to the country’s strict quarantine laws concerning live animals the whole event was moved to Stockholm. The FIFA world cup was in 1958 held in Sweden, and the Råsunda Stadium in Stockholm was where the final was to be played. Brazil won over Sweden with 5-2 , and the world saw for the first time the only 17 year old Pelé in action. This was a short story about Stockholm, please enjoy the city if you are heading there for the 2016 Eurovision Song Contest.